must have been warm in 2003! SCOTTISH international ultra distance runner Les Hill made a triumphant return to the town last Saturday to win the annual 50 mile Rowbotham's Round Rotherham Trail Race. In a close finish to last year's event Dumfries Running Club athlete Hill (47) just missed out on victory-but this time around he made no mistake and won the event by a substantial margin. Competing in the race for the third time Hill's pre-race preparation proved to be the key to his success. He said: "Back in August a group of athletes from Dumfries RC came down with me for a weekend during which we reconnoitred the second half of the course. Knowledge of the route was psychologically very important as it gave me a lot of confidence. "The underfoot conditions for the race were perfect but if anything the weather was too warm. I knew that I could win after I reached Maltby in around five hours and I just had to tell myself to keep going. "It is absolutely great to have finally won and I just hope that I can come back again next year to defend my title," he added. 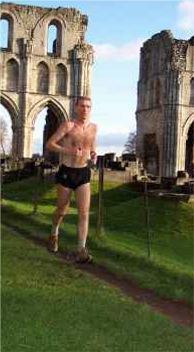 Hill's time of 7 hours 7 minutes 23 seconds brought him across the line at Brampton Leisure Centre ahead of runner up Rotherham Harrier Mike Armstrong who recorded a personal best of 7:28.27. Swinton man Armstrong (41) was competing in the race for the fourth time and his highest previous placing had been sixth. The Sussex born army reservist was delighted with his performance. He said: "The conditions were brilliant and considering that I only really started serious training three weeks ago I was happy with the way I ran. My boss Peter Fergusson at Trianco Boilers at Chapletown has been a great help in allowing me time to train. "I was determined to do well as I was running for Sheffield Children's Hospital and thanks to some generous sponsors I have raised around £1000." Macclesfield's Mark Hartell (7:36.33) filled third place, in fourth spot was 2002 winner Rotherham Harrier Kerry Booth (7:46.03) who was accompanied across the line by his team-mate Mick Marsters. Kimberworth Strider Philip Martin (8:09.53) was eighth, club colleague Martyn Gaynor (8: I0.49) ninth while Rotherham Harriers Phil Hague (8:23.31) and Mick Cochrane (9:02.09) were 12th and 18th respectively. First man home for Rother Valley Swallows was 21st placed David Devine (9:14.37). Armstrong, Booth and Marsters were successful in retaining the team trophy for Rotherham Harriers ahead of Macclesfield’s Mark Hartell, Stephen Watts and Julian Brown. The women's race produced a dead beat for first place. Sharing the honours with a time. of 9:02.34 were 46 year old North Yorkshire Moors AC runner Cath Worth and 27 year old New Marske Harrier Shelli Kempson who were both competing in the race for the first time. Glasgow based Australian Sarah Kleeman (9:18.34) filled third place. Successfully defending their title in the eight stage relay was Rotherham Harriers Older Men in Black veteran's team of Peter Neal, John Comrie, Steve Gaines, Terry Eastwood, Alan Chell, Peter Shaw, Nigel Brookes and Peter Mirrlees who stopped the clock on 5:35.43. Runners up were the Kimberworth Striders Yellow Fever squad (5:51.42) of Martin Broadhead, Shaun Hogton, Roy Nixon, Ian Brookes, Peter Bunker, Steve France, Keith Ward and Patrick Rooney with Dumfries RC's Doonhamers team (6:10.13) in third. Picking up the mixed team prize in overall fifth place behind City of Sheffield AC (6:10.49) was Maltby Running Club Marauders squad (6:37.39) of Rachel Smith, Caroline Boyd, Andy Thompson, Mick Barber, Gary Durham, Barbara Rusling, Gavin Hamilton and Steve Durdy. Rounding off a splendid day for the visitors from Scotland was the Dumfries RC Diva's ladies team (7:27.52) who were first women's team ahead of Rotherham Harriers defending Women in Black outfit (7:28.40) of Sharon Merrills, Patricia Wells, Jenny Horan, Jackie Shannon, Gillian Taylor, Hilary Garrison, Anita Cavell and Adele Morris. quite believable. For most of the day I just had a lifa vest on top. thanks for another great event and for laying on such good weather, yet again. Another excellent event, enjoyed by everyone. Your weather gods are very effective! Just wanted to say thank you to you and your team for the event last Saturday. I completed with 3 mins to spare. It was the longest unbroken stretch I have ever done. I was dead chuffed but knackered. Please thank our guide who brought us home. Without him, I reckon I would still be wandering now. I did the walk as a qualifier for the 100 in May. I am undecided as I am not thinking about it whilst I am still sore ! Thanks again and well done. The organisation was great and your team really friendly. 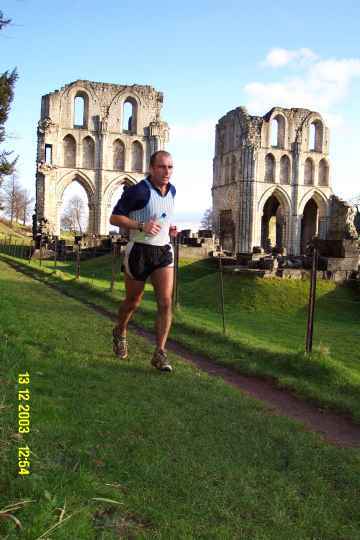 For those who missed the 22nd running of Rowbotham’s Round Rotherham, it is an ultra-distance cross country trail event following the approximate route of the ROTHERHAM boundary, for 50 miles / 80 km along footpaths, towpaths, tracks and roads, based on an idea from then club secretary Ralph Rowbotham. This year, there were 134 starters, walkers, slow and fast runners (of whom 118 finished) and an 8-stage relay with 13 teams. Colin Jackson had a run-in with a car and had to retire but fortunately he did not need hospital treatment . Later in the day, the Radio 4 weather report gave the warmest place in Britain on the Saturday as Rotherham, South Yorkshire, which was quite believable. For most of the day I ran in a lifa vest.